When Shark Boy was two he LOVED construction equipment. There is simply no way to overstate his feelings for bulldogens and epsivators (bulldozers and excavators), for dumps and scoops (dump trucks and backhoes). 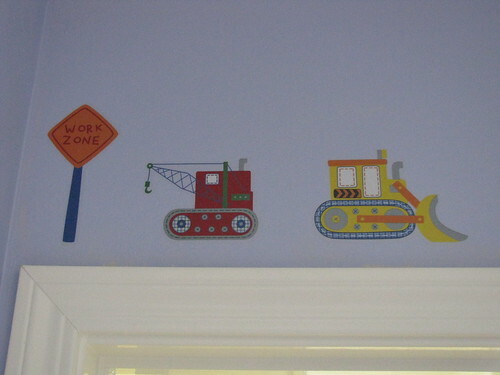 When we put the crib away I searched for construction theme items for his "big boy" room (which are plentiful, btw) and it turned out really cute. Now, it's time for a change. He no longer squeals with delight when we pass a construction site. He loves sea life, and also Star Wars. And of course, there's football. He is turning 7 soon and needs a "bigger boy" room. His room has lasted 4 years and I'm happy with that for a toddler room. I want the next iteration to last at least that long. I am thinking of doing a "base plus theme" approach for his room. So my "base" would be the basics - drapes, quilts, lamps, etc., done in a stripe or plaid that will be ever appropriate for a growing boy. The "theme" would come in with the valances, sheets, pillows, art work - things more easily (and less expensively) changed out to reflect his interests. I could start by keeping his red drapes which I like, just changing valances (which would be inexpensive to switch out), and keeping his lamps. I'm struggling because my impulse is to "do a theme!" I see the Star Wars set at Pottery Barn Kids and he would love that so much! The Star Wars phase could last another 4 years for him. Or not. If it doesn't, will he even care about still having this quilt? I have set some money aside, I'm in no hurry and can wait for sales. What do you think? When you do your kids rooms how do you approach it? Do you choose a theme? Is it based on their favorite toy/movie/etc.? Or do you go generic? And do you let anything fly (like allowing a bunch of football posters go up in your carefully designed sailboat room)? *At the time, he really wanted his walls painted "Home Depot orange" but he (thankfully) settled for buying sheets in Home Depot orange. Of all the themes, Star Wars has the potential for lasting longest (let's hope not into college). 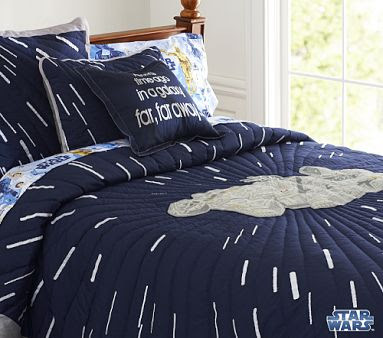 If I were concerned about longevity & price, I would do a solid navy comforter with the Star Wars sheets/pillowcase. Then you could accessorize with whatever Death Star cool stuff you find. You are a fun mom to do this for him! As my girls got older, I went with their favorite colors. My oldest loves purple and green. She has always liked purple, but the green is a fun new addition. I made her quilt from 2 different horse prints and backed it in purple and green. I am pretty sure she will always like horses. Either way it's a pretty grown up print, so it will last for a while. My baby loves pink and purple. So I made her a pinwheel quilt featuring her favorite colors in florals and scrolling prints. I would say go with a basic based on his favorite colors. Stay away from the star wars theme. Our generation had a group of star wars fanatics, and they are still getting made fun of. 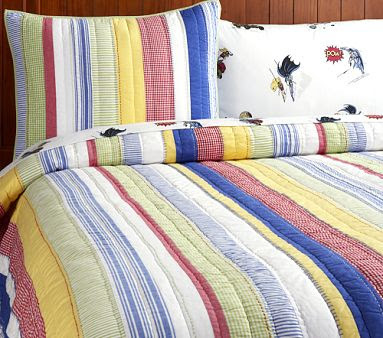 I found a Chaps quilt that is simply blue and white checked and put one on each of their beds. (They were 80% off, yo!) I am now in the process of convincing them to let me go all 'outdoorsy' on their room since I have all the Wyoming, Montana and Smoky Mountains art hanging in there already. Bonus is bucking the system and insisting he wants a 'frog room' and Deuce could care less as long as he gets to sleep with his brother. 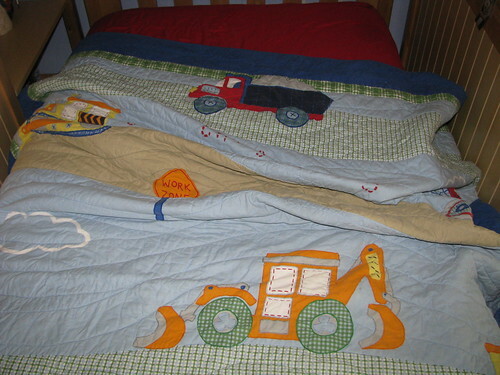 The construction equipment quilt is so cute! I don't have any fresh advice on the new iteration, but kellyskornerblog.com is doing a "show us where you live friday" series, and I think tomorrow is kids rooms, so there will be hundreds of blogs showing their kids' rooms linked to hers, if you need some inspiration! I used the Madras when my son was young, but he didn't seem too interested in a decorating theme. Teen years we moved to a bottle green theme that he liked. Since Shark is getting close to the age where he might be teased for a thematic room, I agree with the suggestion of Star Wars sheets and accessories that can be replaced more easily. I've stayed away from themes because their interests seem to change quickly (and I'm too lazy to keep redoing their rooms!). I go with a basic comforter and curtains...and they decorate the walls with posters or artwork or whatever it is they are into at that moment. Right now there's some pokemon and transformers up on their walls. I figure it's pretty much the only space in the house that is THEIRS and they should do what they want with it. Meredith - I weas thinking along those lines. Do Star Wars sheet and a solid or stripe quilt. But look at the Star Wars quilt!! AHH! Amo - That's my plan - to find those super sales! 80% off sounds perfect. Jessica - Thanks for the blog link. Perfect timing, I will check that out. Pop - All his friends are SO into Star Wars I can't see him getting teased for that (they'd think it was awesome) for a while yet. I can see him getting teased for his construction room pretty soon though! I'd go with the madras, but if you really want to see him happy, you're going to have to do the Star Wars thing. And really, how long do comforters last? I don't think you can expect him to take his to college, or anything! You'll probably be buying another one in 5 or so years, so make him happy now (while it's as easy as buying a blanket!). For years, my 10 yo son could care less about what his room looked like. Now he wants a "sports" room complete with a lifesize Fathead decal of Lebron James...and Cavs colored paint on the walls (can you tell we live near Cleveland ;o) Looks like I'll be plenty busy with his room renovations. evenshine - You think like me. Madres = very nice and practical. Star Wars = THE KID IS OVERJOYED! Anyway, good luck deciding on the theme. How about doing a space theme? Not specifically Star Wars, but moons, planets, etc? And incorporate a few Star Wars pieces in it, so if he gets sick of Star Wars, you won't have to re-do his entire room? By the way, I'm completely in love with PBK, too! I think you could do Star Wars theme accessories such as sheets and pillows and artwork and just a solid navy comforter and valances? That way it wouldn't get too "themey." Do you ever check out Company Store Kids? They have great sales. I also like to look for things on ebay. Miss C wants a leopard/rock star theme. Not sure I like that ONE bit. ;) She also loves horses and I found the cutest horse theme comforter set on ebay and that would still jive with her butterfly decals and cute butterfly rug from Company Store Kids. Fun, fun. I love to dabble in decorating although LORD KNOWS I am no decorator. It's fun and I know what you mean about hanging on to every moment. It goes by so fast! Sniff. Confession: I really, really like decorating rooms. That is why I don't care (that much) that Alexis wants a ridiculous theme in her new room. It'll be even more fun to banish Zac Efron when the time comes than it would have been if she had gone with some other theme. Although, I'm dying to do a fairy room. I wish Alexis was digging on the idea. Blonde Mom - Leopard. Well - it's temporary! Burgh Baby - I love doing the kids rooms too!! LOVE it. Good luck with Zac. heh. I love decorating. I have to remind myself it's about the kids and not me. I think comforters and accessories are easy to change out, last for about 4-5yrs and then you have to buy new ones anyway. I painted a basic color and chose furniture that will last forever b/c painting is the most work and furniture is the most expensive. Outside of that...I say let him help you pick out the accessories and go with what he likes. 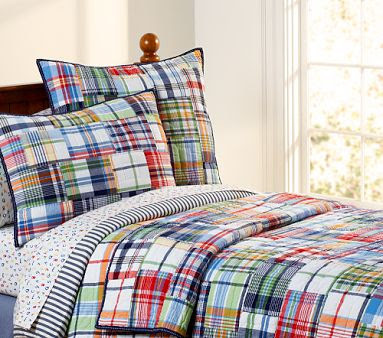 Since his big boy bed is being delivered today, I've been looking at themed bedding. There's Thomas the Tank Engine. There's outer space. And a really cool Crayola undersea adventure theme. We just bought some dark blue/navy solid and striped sheets for now. We can add theme type stuff later. I've always been "anti'theme" with the kids rooms. When my friends were doing up their nurseries with Noah's Ark or Classic Pooh, I went for coordinating florals and stripes...mostly because it bugs ME to think of having to replace a "Dora" comforter in two years once it is passe to them...but if it doesn't bug you, you can afford it and you're willing to possibly replace in a few years- go with whatever they will love! it must be in the water or something - i just posted about house stuff, and my friend Nat is posting house stuff too. I did the basics - i got fish sheets from PB, and coordinating solid quilts from Target - looked like they came from The Company Store or PB - and that's about where i stopped. i need to define it more -which i'm going to post about at some point. He chooses the themed sheets and a throw pillow(C3-PO?, and then you can choose a comforted set that coordinates. The sheets will wear out first, and it's conceivable you'll have to do all this again in another few years. 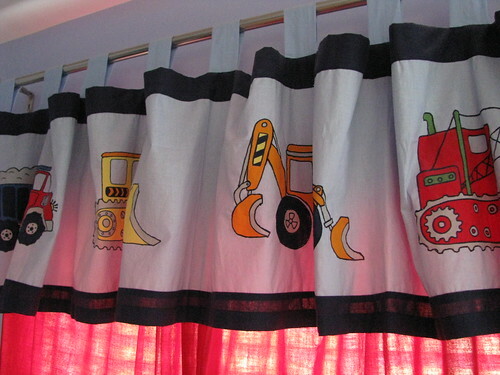 Because I was a broke-college-student-single-mom, I stuck with basic primary colors for Mac's comforter and valances, and then I changed up the sheets and wall hangings as he matured. Once I stopped cleaning his room, there was no telling what any "theme" was anyway...Oh wait, the theme was "clutter loving boy..."
My daughter has butterflies and flowers and my son has Spiderman. We have been in our home 4 years and my daughter is begging for a new theme, or a new bed and curtains.